A film night is taking place next month to coincide with the Trafficking Culture exhibition at the Hunterian Museum in Glasgow. A screening of Dance of Maize God will be followed by a panel discussion with Trafficking Culture coordinator Simon Mackenzie and Research Fellow Donna Yates. The event will take place at the Hunterian on Thursday, December 3 from 5pm to 8pm. The documentary film, directed by David Lebrun, explores the royal life and rich mythology of the Maya, as well as the tangled issues surrounding looted art. The Trafficking Culture exhibition, which runs until January 3 2016, focuses on four locations: Iraq, Cambodia, Italy and the Maya countries. 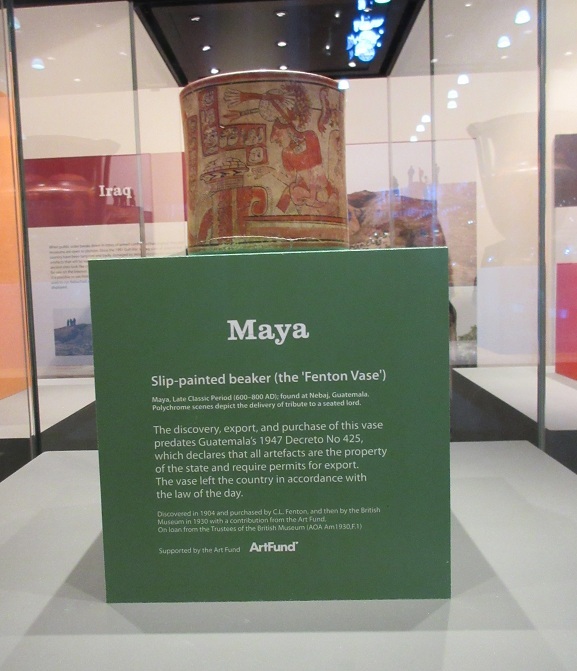 A slip-painted Maya beaker known as the “Fenton vase”, on loan from the British Museum, is one of the objects on display.